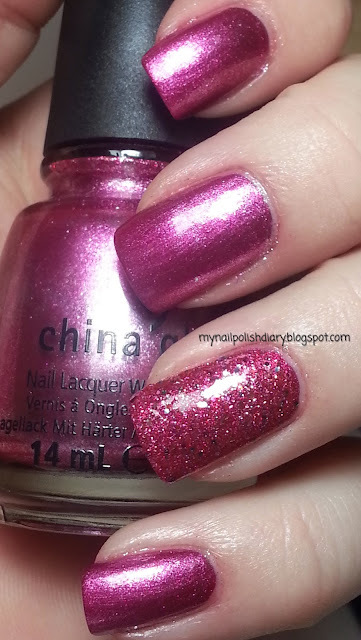 My Nail Polish Diary: China Glaze Mistletoe Me! with OPI Excuse Moi! Foils are one of my favorites for polish finish. They used to be my top favorite. I still love it, it's just not my number 1. It's a gorgeous finish. China Glaze Mistletoe Me! is from the Ulta exclusive release Holiday 2011. The first time I wore this I was in love. Same with the next few times. Pretty berry pink color that I adore and love to wear. It's also a dupe for Color Club Hot Like Lava. I added OPI Excuse Moi! from the 2011 Muppet's Collection holiday release. Excuse Moi! is also a hot pink base with pink and silver glitter. There's also some round multi colored glitter. It works perfectly with Mistletoe Me! Love the combo.